Comments: The best sounded boot from this concert I've come over, so far. Sound quality is 'amazing' to be an audience recording. On disk 2, in the middle of 'I want to break free', it's from another source, same concert just a bit different sound, but nothing to write about really. (I just mention it). 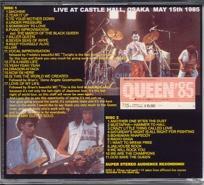 If your looking for a '85 concert, get this one !!! Nice and complete. 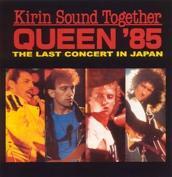 Last concert of the '85 world tour, and the last QUEEN concert in Japan. This show was released (on 'silver' pressed cd's) by Japanese WARDOUR label in March 2006. To me, it sounds like Wardour did a re-release of this 2cdr bootleg. Roots: Not taken from another bootleg lp or cd, only the sound on the tracks from '..break free..' to the end on disk two, seems to be been from "Queen's last stand 1985" source, but ONLY this part.